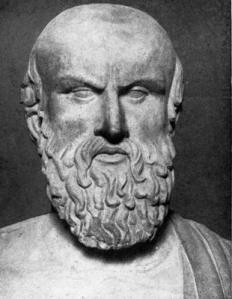 Aeschylus (Αισχύλος, Aischylos) was an ancient Greek playwright (5th century BC), the earliest Greek tragedian whose plays have survived to the present. He won multiple awards, and is credited with several major innovations in writing for the stage, including the practice of having multiple actors with speaking parts. Previously, the usual format had been to have a Greek Chorus telling the story, with a single actor playing the parts of individual characters, swapping between them as required. The addition of a second actor opened up the dramatic possibilities: with two speaking characters on stage at a time, characters could for the first time be shown interacting with each other. Aeschylus also served as a soldier during the Persian Wars (an aspect of his life that gets more space on his gravestone than his literary achievements). His oldest surviving play, The Persians, is set during the Wars, and was the first Greek tragedy to be set during recent history instead of in far-off mythical times. There is a persistent legend that Aeschylus was killed when an eagle dropped a tortoise on him from a great height, thinking that his bald head was a stone that would crack the tortoise open. Another surviving tragedy, Prometheus Bound (Promētheus Desmōtēs), was attributed to Aeschylus in ancient times, but its authorship is now in doubt. Values Dissonance: In an extant fragment of The Net Fishers, an infant Perseus masturbates a satyr. Stress on "infant". This page was last edited on 25 January 2017, at 03:14.